A bald eagle on the website of the U.S. Fish and Wildlife Service. The Obama administration has let it be known that expanding power-generating wind farms is more important than protecting golden and bald eagles. 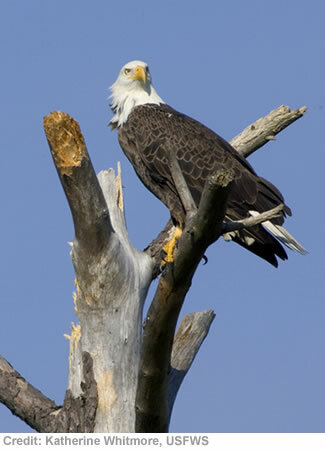 Federal officials announced on Friday (Dec. 6) that wind power companies will be allowed to kill or injure a certain number of eagles for up to 30 years without penalty. Eagles are federally protected, and because wind farms inevitably kill some, they need permits to do so. Until now, these permits were good for five years. Now the administration will issue permits for 30 years. The industry says wind farms are involved in less than 2 percent of human-caused eagle deaths, and the new rules will still require reviews every five years, and if more eagles are killed than expected, new restrictions could be imposed or permits could be canceled. Shutting down wind farms is not likely, though. As long as wind energy remains a darling of the government, getting subsidies and favorable laws, wildlife is just going to have to suffer. If they do start killing more eagles, it would likely be due to an increase in the population of eagles. In “their” eyes, that should mean it’s OK for “them” to kill a few more.. You however…….